If you are unsure of what goes into hoop house construction, you may be surprised to learn it is not all that complicated. In fact, it is relatively inexpensive and much easier to construct than a traditional greenhouse. What Is a Hoop House? 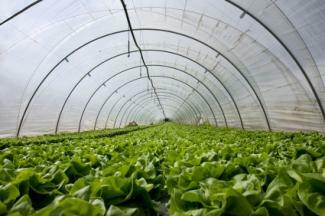 A hoop house is a type of greenhouse used by home and commercial gardeners. Instead of glass panes and metal frames on all four sides, hoop house construction involves curved tubes for the roof and sides. The ends may be constructed of metal and glass frames or of the same materials used for the sides. The main advantages of a hoop house over traditional greenhouses are ease of assembly, mobility, and cost. While a traditional greenhouse can cost hundreds or even thousands of dollars for even a small one, hoop houses run a fraction of that. A home gardener should be able to build a hoop house in an afternoon and use it for plants the next day. Before starting, determine how big an area you want for your greenhouse. Measure the area and mark it with wooden stakes and twine. For best results strive for a level surface so if the area where you plan to put your hoop house is not flat, even it out by adding dirt and smooth with a rake. At each corner, hammer in a rebar stake until only about 12 inches protrudes from the ground. The height of your hoop house is determined by the length of PVC pipe you use. Ideally your hoop house will be tall enough in the middle for you to comfortably stand and move around. PVC pipe is sold in lengths around 20 feet. To make construction easy you may want to use one 20 foot pipe for each curve in your house. To assemble have a friend insert one end of the pipe onto the rebar stake while you insert the other end in the rebar stake on the opposite side. Make sure each of you hold your ends firmly or the pipe could fling back and cause injury. Place additional rebar stakes every three to five feet. With your friend's help, insert the remaining PVC pipes onto the rebar stakes until all the hoops are complete. Cover the house with plastic sheeting and duct tape or staple into place. To keep the wind from blowing your house away, anchor the bottom of the plastic sheeting to the ground using concrete blocks or raised flower beds. When the growing season is over, it is simple to take down the plastic sheeting, unhook the pipe and pull up the rebar stakes until you are ready to use your hoop house again. Now that you have learned about hoop house construction, try your hand at greenhouse gardening. Not only will the hoop house protect your fragile plants from wind and cold, you can get a jump on the growing season by starting seed flats well before your last frost date. By the time mother nature is ready to provide warmth and sunshine, your seedlings should be well on their way.